The History of Gothic Architecture dates back to the 12th Century. This was an exciting time in Medieval European history. 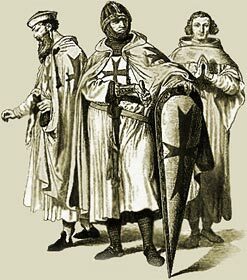 Many Knights had travelled to the Holy Land on Crusades. They had seen the magnificent solid fortresses of the Byzantine Empire and these massive buildings influenced and revolutionised castle building ideas, engineering and architecture impacting the emergence and history of Gothic Architecture. A new, Gothic Style of architecture and decoration emerged in France. It was initially simply called "The French Style". The Gothic architects started to apply ribbed vaulting and pointed arches to emphasize light and soaring spaces. The focus on vertical lines increased as did the ratio of glass to stone. The new French Style of architecture applied at first to churches and cathedrals in France soon spread to other structures. Its earliest appearance was in the choir of the abbey church of St Denis, dedicated in June 1144. The views expressed during the Renaissance period of history led to a different name for the French style of architecture - Gothic. Appalled at the abandonment of classical Romanesque lines and proportion it was derisively called "Gothic". This title alluded to the Barbaric Goths, or Visigoths, who, led by their leader Alaric sacked Rome in 410AD which ultimately led to the fall of the Roman Empire. The History of Gothic architecture evolved over a period of 300 years. The results were bright and airy interiors with soaring spaces, a focus on the vertical using pointed arches, spires and pinnacles. More emphasis was placed on decorative ornaments and stone work carvings. Gothic architecture spread throughout Europe although the history of English Gothic architecture moved more slowly retaining heavy walls and tall windows. The earliest and most famous applications of Gothic architecture in England are at Canterbury Cathedral and Westminster Abbey. The Medieval Times website provides interesting facts, history and information about the great artists and important historical events which scatter the Medieval History books on the subject of History of Gothic Architecture. The Medieval Times Sitemap provides full details of all of the information and facts about the fascinating subject of History of Gothic Architecture during the historical period of the Middle Ages. The content of this article on Medieval art provides free educational details, facts and information for reference and research for schools, colleges and homework for history courses and history coursework.